bevretailersconference.com WHY YOU SHOULD ATTEND Beverage alcohol retailing is getting more and more competitive, and retailers looking to improve their businesses need to get more innovative. We all know that you may not be able to control the circumstances or your competitors in your marketplace, but you can control how to respond to them. Beverage Alcohol Retailers Conference (BARC), a two-and-a-half- day conference, delivers best ideas from top industry experts, best practices from retailers like you, the latest trend information from those who track beer, wine and spirits from all around the U.S. and tools that you can use to transform your business. Beverage Dynamics recognizes retailers each year from throughout the country who demonstrate innovation, excellent customer services and superior beverage alcohol industry knowledge. We will be honoring our Retailers of the Year at the Beverage Alcohol Retailers Conference. Join us and learn how they have transformed their businesses to succeed. HOST HOTEL Radisson Blu Downtown Minneapolis, contemporary comfort in the heart of downtown Minneapolis. The Radisson Blu is just a 5-minute walk from the Nicollet Mall light rail station, which con- nects directly with the Minneapolis International Airport. Radisson Blu features plush, modern rooms and free Wi-Fi, fl at-screen TVs, minibars and more. Amenities include a hip farm-to-table restaurant and a sleek cocktail bar, plus a gym with views of the city skyline. There's also a 24/7 business center. The Beverage Alcohol Retailers Conference has secured a room rate of $219. 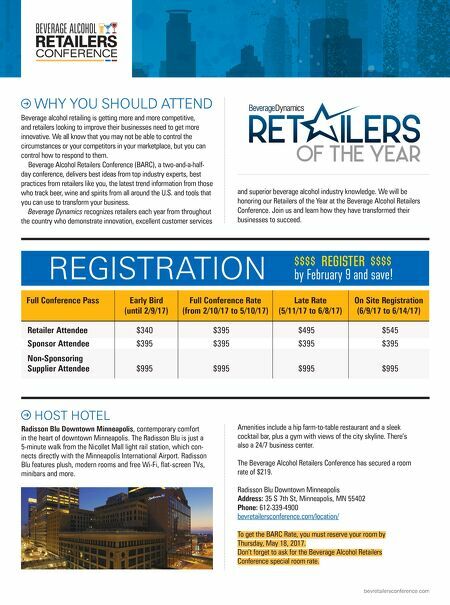 Radisson Blu Downtown Minneapolis Address: 35 S 7th St, Minneapolis, MN 55402 Phone: 612-339-4900 bevretailersconference.com/location/ To get the BARC Rate, you must reserve your room by Thursday, May 18, 2017. Don't forget to ask for the Beverage Alcohol Retailers Conference special room rate. REGISTRATION Retailer Attendee $340 $395 $495 $545 Sponsor Attendee $395 $395 $395 $395 Non-Sponsoring Supplier Attendee $995 $995 $995 $995 Full Conference Pass Early Bird (until 2/9/17) Full Conference Rate (from 2/10/17 to 5/10/17) Late Rate (5/11/17 to 6/8/17) On Site Registration (6/9/17 to 6/14/17) $$$$ REGISTER $$$$ by February 9 and save!